Believe in what you buy. Buy something new. I don’t mind. It’s not my choice, it doesn’t impact on my decisions. That’s the great thing about our BNN project – we buy nothing new. It’s pretty cut and dry, it doesn’t have too many grey areas, we can live by that. It doesn’t mean we feel judgemental towards anyone else for their consuming decision making. What it does mean is that we get to show others that buying nothing new is possible, and it also might give people an opportunity to think about their consumption habits in a conscious way. I think, mostly, the buy / sell process is automatic for most people now. We never really thought about it before our first year began. We had started to buy fair trade coffee and avoid products with palm oil. We were becoming more aware of where our food came from. We knew a little about the unethical production of Nikes. We avoided Nestle. If it was a well-publicised boycott, we knew about it. Otherwise, we were a bit mindless when it came to our spending. We also didn’t realise that there were alternatives to consuming. The thing about becoming a conscious consumer is that it doesn’t mean you have to stop consuming. For us it means buying second hand or not at all. For others it may mean buying fair trade, or from stores that provide something back to communities who need it (think Oxfam shops). For some people it may mean buying locally, or supporting small business. For some people it is about buying Australian (or American or Mexican or wherever you happen to be based) made. For some it is about avoiding purchases that may inadvertently support labour camps or that encourage criminally low wages and the exploitation of children. Some may splurge on high quality household goods, knowing they will (probably) never have to replace them. Some will buy branded clothing that can then be passed on at a fraction of the price to people like us who buy nothing new. The point I’m making, is that buying nothing new is one way. It’s our way, and we like it. We will probably do it forever. Either way, I think it’s important that we think about what we’re buying, whether we need it and where is has come from. Don’t just be a cog in the wheel of someone else’s design. Make your own wheel, or become a part of something you believe in. Contribute your hard earned dollars to something that matters. News from the phone bedazzling stall. For those wondering, I have not been captured by militant consumers and chained to a phone bedazzling stall inside a cavernous shopping centre, nor has Mama Fearse hobbled me just enough for me to be able to change nappies and ignite the barbeque yet not type. I have been, in all honesty, lazy and unconcerned with writing as of late. Hopefully this post will change the tide of words to the more succinct and entertaining. Our first buy nothing new year has had an enormous effect on me. I no longer desire sneakers, at all. I said starting 2014 I was going to purchase a new pair to replace the couple of tired pairs that I have been wearing since the late 90s. As the clock struck ’14 though, I realised these old pairs had served me so well thus far and besides being a little worn out on the insides they still serve their purpose. I really like the idea of having a pair of new kicks to strut about the court in, but I don’t need them. Also late last year I broke the screen on my laptop. I looked into having it repaired and found it would be cheaper to replace the computer outright. I had the money to replace it, but never did. 2014 rolled around and as I type this from said broken laptop attached via HDMI to our TV, I have decided to purchase a used monitor** and connect the laptop to it essentially turning this laptop into a desktop. It showed me that really thinking through and examining all options and avenues will often lead to a more sensible emotional and financial decision. I have got used to using my laptop in this unorthodox manner and truthfully having it at school with me was more of a distraction than a convenience so I think this will work out best for me and having the computer stuck in one place will also mean I won’t be spending as much time in front of it and more time will be spent chasing Lil Fearse around the house. So there are my newest revelations readers, I will be sure to check in with you all more often from now on. ** Post writing but prior posting I managed to acquire an old monitor from Freecycle that, with the addition of an HDMI adaptor, should do the trick. As well as selling some of our random goods, we’ve also found plenty of places lately to give our things away. Once we were a one stop donation family – the local St Vinnies. No longer! Since really analysing what we have to give away we’ve realised a few things. I’m going to break out the dot points here. Op shops only want things they can sell. They don’t particularly like books. They definitely don’t want things in poor condition. They do not want your electrical goods. There are many, many, many specialised charities looking for particular goods at a particular time. Freecyclers tend to be really picky about what they want and what they don’t want. It’s hard to know if people are being picky because they want to get something for free to on-sell, or if they really can’t afford that one thing they really need, and they really need a particular type of that thing. It sometimes feels like it’s less about giving away and more about getting. So here’s a mini run down on things we’ve given away. Rags to the Country Fire Authority: the local CFA has a small wheelie bin out the back for rags. They ask for cotton-only clothing with no zips or buttons. I was able to donate some of the badly stained children’s clothes I mentioned here. 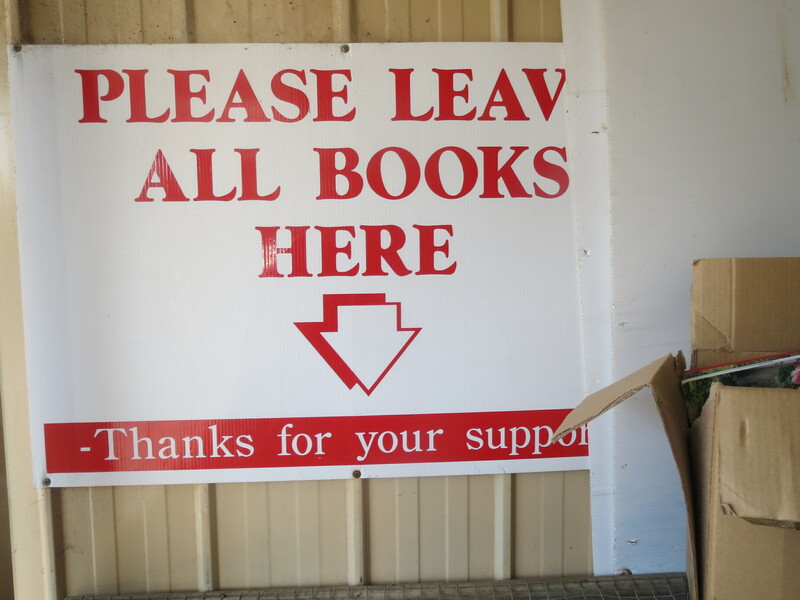 Books to a retirement village: Melaleuca Lodge Retirement Village on Phillip Island has an attached second hand bookshop. The bookshop raises money for the village. We donated a huge box load of books here. We have also recently discovered that our local YMCA where Little Fearse goes swimming has a book corner you can give your books to, or purchase books from for a small amount. I’m not sure who the money goes to. Bill’s Bookshop – that’s our box of books right there. Toiletries to a woman going to an orphanage in Fiji: Through a FB group I have ‘liked’ I discovered a woman was looking out for toiletries to take with her on a trip to a Fijian orphanage. She was after soaps and shampoos for the children and wanted to take some special items for the women working at the orphanage as gifts. I receive a lot of toiletries as gifts from students at the end of the year and often don’t use them. I donated a variety of hand creams, perfumes and soaps to be taken to Fiji. Children’s clothes on Freecycle: When I last received the clothes on Freecycle there were many I didn’t need. I took out the ones destined for ragdom (above) and redonated the rest to a Freecycler, with some added unwanted items of ours. It’s good to see them being passed on and on. The woman I received them from originally got them on Freecycle, too! Household goods to St Vinnie’s: I know that kitchen items sell well at St Vinnie’s, so I didn’t hesitate to donate these to them. I also donated toys and other random children’s goods. Our clothes to Red Cross: Our local Red Cross op shop is very small and only receives clothes, so we donated ours here. I’m going to make just one final point on donations. During the severe 2009 bush fires in Victoria BP and I volunteered to help sort the clothing and goods donated to families who had lost their homes. There were two huge HUGE warehouses full of clothing and household goods donated. Some of this stuff was really useful and would have really helped families resettle. A lot of the stuff was really awful. Stained. Full of spiders. Torn. Worn. Broken. Covered in animal hair. Stiff with food or bodily fluids. Seriously. If it is in such bad condition you wouldn’t wear it – don’t donate it. Find a different way to recycle it. (For instance, if it’s pure cotton put it in the compost – the worms will love it!) It’s an insult to those people who have lost their EVERYTHING to think that they will enjoy wearing your stained, see-through, torn, hairy old clothes. We’d love to hear about other places you have found that liked to receive particular items. If you’re looking to pass on any of your baby goods and you live in Melbourne, I’d highly recommend you check out whether it is something St Kilda Mums needs. They do a great job re-homing baby goods for Mums in need. We’ve recently had a bit of luck with selling things using three forums – eBay, our local FB Buy/Swap/Sell and Gumtree, an Australian classifieds site. I’ve often thought about selling things in the past, but usually ended up deciding it was too hard and finally donated whatever it was. This isn’t a terrible outcome, of course. I always think that you should only donate quality goods that you would yourself buy. If you didn’t already have one you were working on getting rid of. Since we’re getting rid of so much stuff this year I thought it was worth trying to sell some things. I’m especially keen to see my vintage clothes and accessories going to people who understand how unique they are. (Call me strange…) I’ve also been helping Mum and Dad sell some of the books that we cleared out a few weeks ago. After a few false starts with eBay, I seem to have worked out a system of listing items quickly and then just re-listing over and again until they sell. The hardest things to list are books, because you need to include a lot of information about the condition and editions etc. It took a long time to list my Mum’s childhood books. It took over two months for them to sell, but sell they did. Choose what to sell through your local Buy/Swap/Sell based on your local area. Playstation games, DVDs and baby goods sell really well through my local BSS. Knowing this area this is completely unsurprising. Vintage clothes and accessories sell really well on eBay. Us vintage-o-philes are generally eBay junkies. It’s the best way to find the right fit for a unique item. Books sell better when sold in bulk and on local sites (such as Gumtree) where people can pick up. People are now accustomed to getting free postage on eBay for books and it’s hard to offer that as an individual. I have sold bulk vintage books on eBay, but for other types of books I used Gumtree. Children’s clothing sells everywhere, but is preferred in bulk lots and it doesn’t hurt to have a ‘brand’ in there. eBay buyers tend to be more discerning – they want a lot more information and want your descriptions to be detailed and spot on. I guess this is because there is less face-to-face contact so less incentive to be truthful. I’m always truthful though. I can’t afford that kind of bad karma. The most surprising things may sell. I recently sold some unused nappy fasteners for more than I paid for them. I guess they were just in demand. The interesting thing is that I’ve had more luck selling things lately than giving things away on Freecycle. Those Freecyclers are a weird mob. I started the task of re-organising Little Fearse’s room yesterday. The biggest picture in our clutter collages is her bedroom. She doesn’t actually live in her bedroom yet, which is kind of why things get thrown in there to be out of the way and then never put away. When I was pregnant I was desperate to get her room ‘just so’ for when she was born. Ten months later it is still a work in progress and she has made herself quite comfortable smack bang in the middle of our bed. Or, better, slung across my chest where she can keep one hand firmly planted on her food source. No wonder my back is stuffed. We don’t have any immediate plans to move her into her room (though her cot has finally made it in there, since it’s not being used anywhere else), but it does bother me that it’s become an extension of our messy home. If she wants to have a messy room when she’s older – great. But she shouldn’t have a messy room because her parents are incapable of managing their stuff. 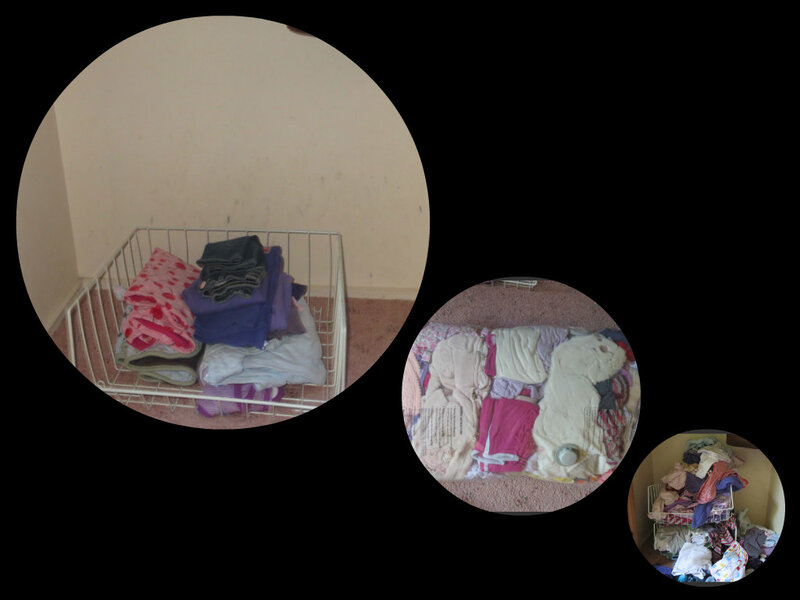 I have twice now made use of our local freecycle community to collect clothes for Little Fearse. Although buying clothes second hand for her is not usually an issue, it is endlessly helpful to have a base wardrobe to start with. This week a local woman passed on three bags of size 2 – 3 clothes that her grand daughters had out grown. I needed to make room for this by finally packing away her size 00 clothes, which she grew out of months ago. I should note that Little Fearse’s clothes are something that just can’t come under the 2-4-1 challenge rules. We hope to have some even littler Fearse’s one day and, of course, plan to re-use as many of the same clothes as possible. To get rid of these clothes to bring in new sizes for Little Fearse at this stage would be definitely detrimental to our future selves. It’s looking more manageable already. And I should also note here for future me to remember – no subsequent children will need any new clothes until they are a year old. Seriously. The amount of clothes we have in storage in sizes 0000 – 0 is absurd! PS Many of the clothes passed on by the freecycler are quite badly stained or unusable. I don’t want to donate them to charity because they are not saleable. What do you do with old, stained clothes? I already have a truckload of rags for raggy things, so I don’t really want to collect someone else’s old clothes for this purpose, too. Is there a charity that collects rags? I have been doing a lot of reading lately of minimalist blogs. This entry from Born Again Minimalist really inspired me. Like the strange woman on youtube whose husband was giving her $1 for every pound of stuff she got rid of (you can hunt for that yourself) I liked the idea of challenging myself to achieve a specific goal when decluttering. I’m learning rapidly that I am personally motivated by specific and restrictive goals, especially when they’re made public, as this makes me accountable. So, can I get rid of 100 things between now and February 15th 2014? Well, originally I thought it would be a fun challenge, but then I counted the number of things in the box waiting to go to the op shop right now. There are 44 things in the box. And those 44 things made barely a dent in the junk in our house. It wouldn’t be so difficult for us to get rid of 100 things, there is no challenge in it. We have too much stuff to begin with. Caitlin, of Born Again Minimalist began the challenge as a person with very little stuff. So we need to get to that point first. How can we get there? Well, here is the challenge I’m setting for myself. For every new thing that comes into the house two go out. At the moment this is easy. I mean, I found 44 items to send to the op shop in the last three weeks. I send large boxes and bags of things to the op shop about once every two months. Where does this junk come from?! This is a problem we’re already addressing with Buy Nothing New. Next step, shifting the stuff we don’t need out of here. In the last week I’ve been able to pass on some baby items we have doubles of or no longer need to a variety of people who are expecting at work. That was doubly satisfying as it meant we were able to help out some new parents in the way we were helped before Little Fearse was born. I have also managed to pass on three excess baby items through Freecycle. I have previously mentioned op shop box ready to go and another box of items ready to list on Ebay. I feel good about this, but also a little anxious about what happens when we’ve shifted the easy stuff and it starts getting sentimental.